Flower & Scorpion is a variation of Bergen, and plays much the same, except that this game uses a pair of dice in addition to the dominoes. Flower & Scorpion is believed to have a Middle Eastern origin. The two dice need to be of different colors. It doesn't really matter what those colors are, as long as they are distinct from each other. One of these is called the "flower", and the other is called the "scorpion". The remainder of the tiles make up the boneyard (known as the "oasis" in this game), and are held in or reserve to be drawn upon at need. Roll the dice at the beginning of each hand. The dice are not used during gameplay, but their values determine special scoring opportunities during the hand. The player with the highest double places the first domino. Play proceeds to the left (clockwise). Each player adds a domino to an open end of the layout, if he can. If a player is unable to make a move, he must draw dominoes from the boneyard until he can make a move. If there are no dominoes left, then the player must pass. If both ends of the layout have the same value, the player scores 2 points. This is called a "dual". If both ends of the layout have the same value, and one end is a double, the player scores 3 points. This is called a "plural". If the flower and scorpion pairs are the same value, they cancel each other out, and no special scoring applies to this hand. 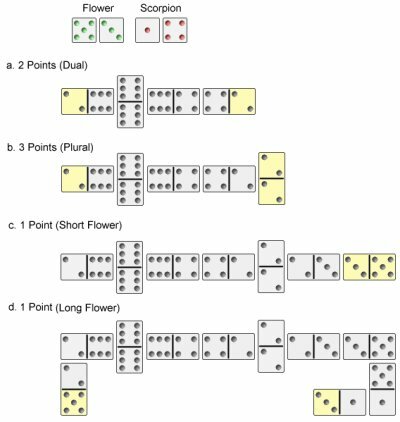 If a player plays a domino with the same two numbers as the flower, the player scores 1 point. This is called a "short flower". If the open ends have the same two numbers as the flower, the player scores 1 point. This is called a "long flower". If the open ends have the same two numbers as the flower, and one of the tiles is a doublet, the player scores 2 points. If the open ends have the same two numbers as the flower, and both of the tiles are doublets, the player scores 4 points. If a player plays a domino with the same two numbers as the scorpion, the player loses 1 point. This is called a "short scorpion". If the open ends have the same two numbers as the scorpion, the player loses 1 point. This is called a "long scorpion". If the open ends have the same two numbers as the scorpion, and one of the tiles is a doublet, the player loses 2 points. If the open ends have the same two numbers as the scorpion, and both of the tiles are doublets, the player loses 4 points. A hand ends either when a player plays all his tiles, or when a game is blocked. A game is blocked when no player is able to add another tile to the layout. The player who plays all his tiles (goes domino). The player who has the flower (one tile whose numbers match the two flower dice). The player who has the scorpion (one tile whose numbers match the two scorpion dice). The player who has the lowest double. If none of thew above conditions are met, then no point is awarded for that hand. A game of Flower & Scorpion is won when a player reaches a score of 20 points.